He's the most patient and gentle dog I've ever know with children and other animals (the exception is birds where he has an insatiable appetite). 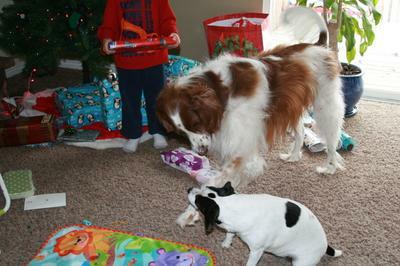 Winston is always loving and playful with his best friends (Jack our son and Annie our Jack Russell). This dog has more love to give than any other I've known. The best friend all little boys should have!! Winston and Annie look a little like the odd couple. Not saying that's bad! It's just fun to see two dog breeds, as different looking as night and day, getting along so well and fitting in so well with your family. Irish Red and White Setters are supposed to be very good with families (if you're OK with shedding), although I have never had one. German Shepherds and Labrador Retrievers have always been on my list. I have also heard mixed reviews on Jack Russell's, although more good than bad. Glad to see you found a couple of good ones!